The Golden State Warriors are about to embark on another post-season run for an unprecedented fourth title in five years. The Warriors are looking to be the first team to three-peat since the Lakers did it in the early 2000’s. Only three franchises in NBA history have won three consecutive championships in a row, the Boston Celtics, the Chicago Bulls and the Los Angeles Lakers. 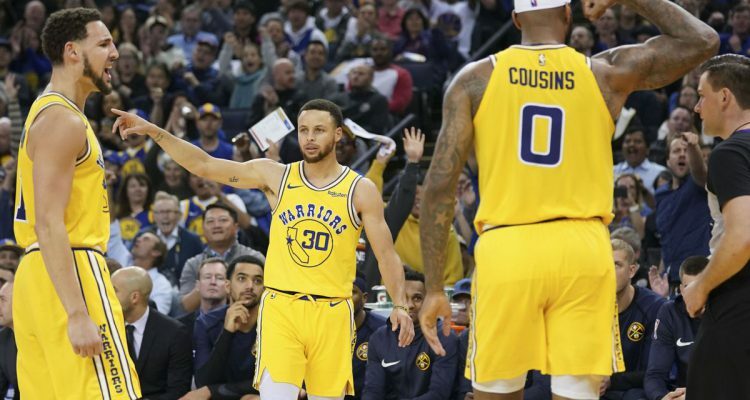 The Warriors have an opportunity to join elite company and it starts with a first round match-up against the Los Angeles Clippers. Before we look ahead to the series against the Clippers, it’s important to reflect on one of the more tumultuous regular seasons the Warriors have had in recent years. They did end up being the number one seed with a record of 57-25, which was actually pretty close to last years with 58- 24. SBD’s win total projections can attest to that. 1. Most memorable game of the season and why? Kevin Durant and Draymond Green screaming at each other during the Clippers game. It changed the entire context of the season. The Golden State Warriors have been very good at masking their issues on and off the court, even dating back to last year. But for the first time since Draymond’s dustup in Oklahoma City in 2016, the fractures within the organization was out there for everyone to see. It took almost from that day on until March for Kevin Durant to seem like a happier version of himself, just in time for the postseason. Who knows how this will affect his decision this summer but the scarier part is how this will rear its head during the postseason now. At the risk of being suckered into recency bias, I think the most memorable game was the last regular season game at Oracle. Wearing the ‘We Believe’ jerseys, all the emotions re: the building, the teams history and Oakland. This season was always about a good-bye to Oakland and Oracle so the game where they pay tribute to it has to be the most memorable. Game at Denver. There was lots of noise coming from Denver and other places regarding teams being ready to take on Golden State. Warriors respond with a 51pt first quarter and cruise to victory. Has to be the game against the Clippers. Kevin Durant and Draymond Green got into it during the game and it seemed like things were getting out of hand with Durant’s looming free agency decision. I was in attendance at the Staples Center that day and the mood was somber. 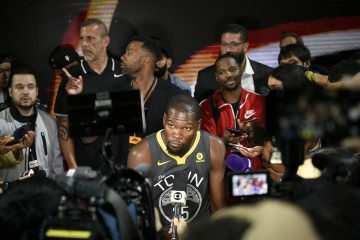 Durant left before the media arrived at the locker room and while the rest of the Warriors didn’t say much, you could sense something was wrong. 2. High point of season? Low point? High point was the beginning and end of the season, where the Warriors seemed fully healthy and ready to tear off huge win streaks both times. The low point was the aforementioned Draymond-KD argument but beyond that, the low point was watching the Warriors struggle trying to care about basketball for what seemed like the entire regular season. High Point: Winning in Houston and in Oklahoma City back to back without Kevin Durant. Those games were a reminder it didn’t matter who the Warriors had or didn’t have, if they play Warriors basketball they will be successful. I thought that was a turning point for a highly talented team unsure what style they wanted to play. After KD returned he found a way to comfortably fit in and the juggernaut felt fully assembled. Low Point: The Draymond/KD blow up. I don’t think I need to go into further detail re: why. High point, Ring Night. Low Point, constant KD to NY rumors/discussions. High Point: Nothing stands out to me as far as a defining moment, but once Durant started to enjoy playing basketball again, you could tell this was a different team. Low Point: This season saw some bad losses at Oracle Arena. The Warriors weren’t just losing games, they were getting outplayed big time. So any of those losses would be my pick. 3. Did Boogie meet your expectations? Yes, and more. Cousins just about looks like his normal self. The issue remains his usage rate when games truly count. Just how much can you maximize your offense and efficiency by taking the ball out of Steph’s hands this much? And in turn, how does this affect KD who is comfortable not shooting now, but what if this was a 1-1 series? He exceeded them. I expected Boogie to struggle more with his health. Achilles injuries have altered career trajectories. I had low expectations for what he could truly bring off of it but so far he looks nearly the exact same guy he was prior. Did Boogie meet your expectations? Yes, but expectations were pretty low. Coming off that injury as a big man made for an unpredictable return, he’s done well and helped bring a new element to this team. Big body can wear on teams the further they go in the playoffs. He definitely surpassed all expectations. I didn’t expect him to come back so early, I figured the Warriors would slow play his return. With time, DeMarcus Cousins looks better and better. You never know what to expect with an Achilles injury, but you can tell Boogie is still a force to be reckoned with . 4. Most surprising Warriors player? Disappointing? The entire Warriors bench has been a disappointment. Jordan Bell has suffered the Patrick McCaw (sophomore slump) and beyond Quinn Cook, the rest have been lackluster at best. Alfonzo McKinnie makes a 3 now and again, Jonas Jerebko can’t play defense, and there is no one that will make a real impact during the postseason. It’s again up to Andre Iguodala and Shaun Livingston to give the Warriors one more postseason of boost off the bench. Most surprising is Kevin Durant’s return to unselfish play the such we haven’t seen since his inaugural season as a Warrior. Too many times, he’s wanted to make it his team on offense. He might be the best player but the offense doesn’t and shouldn’t run through midpost isolations. An efficient 24 points – 8 assist KD leads the Warriors to an easy Finals win. Surprising: Boogie. As I stated above, I was not optimistic re: how he’d look returning from injury. Disappointing: Jordan Bell. Regression year. Immaturity. I still believe in his potential as a player but he + GSW have a lot to figure out. Andre. He’s been healthy and looked good all season. Surprising: Draymond had a rough start to the season and some were wondering if he would ever regain his old form. While he didn’t make the All-Star game, Green bounced back and is looking like his old self. He’s talking and backing it up just in time for the postseason. Disappointing: Has to be Jordan Bell. The Warriors were applauded for stealing Bell from the Chicago Bulls in the 2017 NBA Draft. However, he has not progressed after a good rookie season. The Warriors will need his energy off the bench with Shaun Livingston and Andre Iguodala on their last legs. Klay Thompson. Because he’s Klay. Because why not? Oracle Arena. Now send it out in style with another championship.